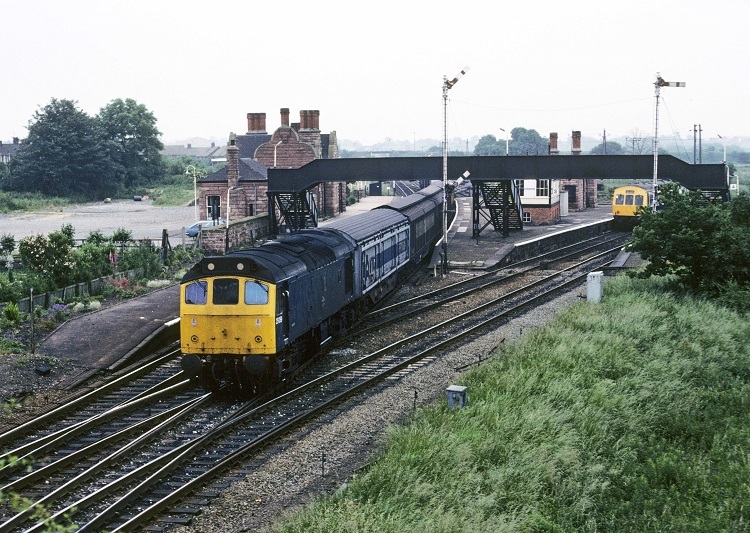 Photograph courtesy Roger Geach A Llandudno Junction - Arpley freight passes through Helsby on June 24th 1983 behind 25089. The lengthy twenty two year two month career of D5239/25089 included allocations to many London Midland Region depots as well being allocated to Eastern & Scottish depots. May 1964 to Nottingham (16D). March 1967 to London Midland (Western) Lines. November 1980 to Springs Branch. 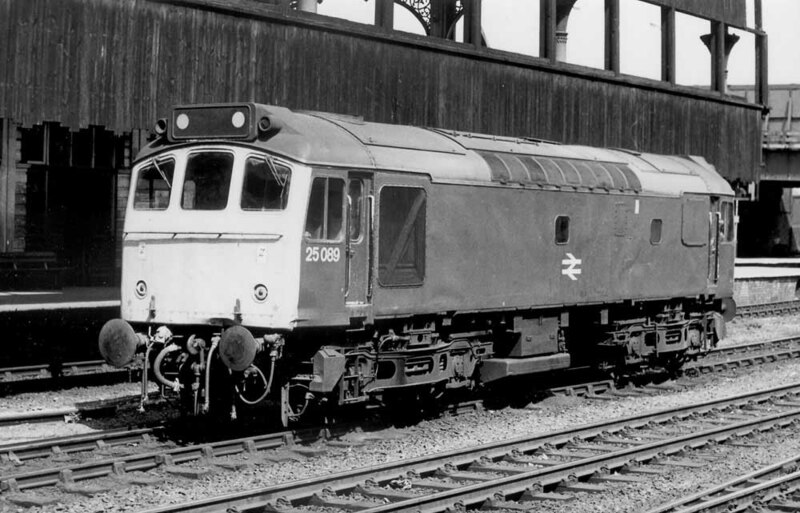 25089 was the 271st Class 25 withdrawn, one of five retired during February 1986. After withdrawal 25089 was stored at Crewe Gresty Lane & Basford Hall. 25089 moved to Leicester Humberstone Road on July 15th 1987 (see detail below) and to Vic Berry's yard by July 20th 1987. By the middle of October 1987 25089 had been scrapped. Noted Derby Works October 1965. Noted Derby Works December 1976 - January 1977. Over the Waverley route the through freights remained solidly in the hands of BRCW Type 2’s and EE Type 4’s, the passenger workings however still remained a mixed bag, with steam frequently covering for failures. Although many Holbeck Peaks covered these workings frequent visitors from the Midland depots continued, the thrice weekly Bathgate - Kings Norton car flats a continued source of foreign power, D55 so noted on March 7th and D5239 on March 9th. On December 31st AM10 071 working the 10.43 Coventry - Euston service collided with some empty derailed wagons near Roade. The leading coach M76155 was severely damaged in the collision. For the clean up Rugby sent out a wiring train led by 5239 whilst 7601 arrived with the Bletchley crane. Mainline services into Euston were routed over to the Midland mainline, via Nuneaton & Wigston using an assortment of diesel power. Tremendous delays were encountered in the St Pancras area due to lack of platform space and the extreme length of the trains, especially the sleepers. The following day creativity took over through the use of the Bedford - Bletchley line, using part of the truncated Hitchin branch, a number of freight sidings and the sharp single track curve at Bedford No 1 box. By the turn of the New Year the lines at Roade were back in service, but the overhead wiring was still inoperative. Southbound electric locos were doubleheaded with diesels over this short section, with a number of Class 25’s acting as pilots. 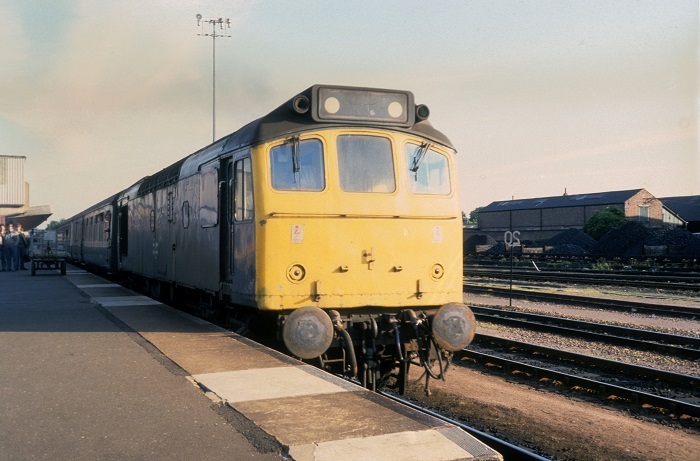 A notable long distance working for pairs of Class 25’s was the Hope (Earles Sidings) – Exeter Central cement, on September 23rd 7501 & 5239 were in charge. On November 9th 5239 worked a late afternoon Severn Tunnel Junction - Exeter Riverside freight, then going forward with an evening freight to Plymouth Friary. The continuing shortage of power on the WR allowed many strangers to reach deep into WR territory, the 18.00 Riverside – East Usk frequently featuring pairs of Class 25’s, November 6th produced 25276 & 25089. On October 16th the 07.15 Peterborough - Kings Cross was worked by 25089 & 31191. Any passenger workings handled during the first decade of D5239/25089's career appear to have so far gone unrecorded. The first recorded passenger working took place on July 18th 1976 with 25089 assisting the 12.15 Birmingham New Street - Manchester Piccadilly forward from Crewe dragging 86256 due to the power being off for engineering work. Early in September 1978 25089 was operating in North Wales. On September 5th 25089 worked the 15.32 Manchester Victoria - Bangor and 19.30 return. Three days later (8th) it was the turn of the 07.47 Manchester Victoria - Bangor and 11.30 return. On August 5th 1979 25089 worked the 09.15 Birmingham New Street - Taunton. 25089 & 25097 worked the morning Mountsorrell - Kennett stone train on June 13th. The 09.15 Birmingham New Street - Taunton was worked by 25089 on August 5th. 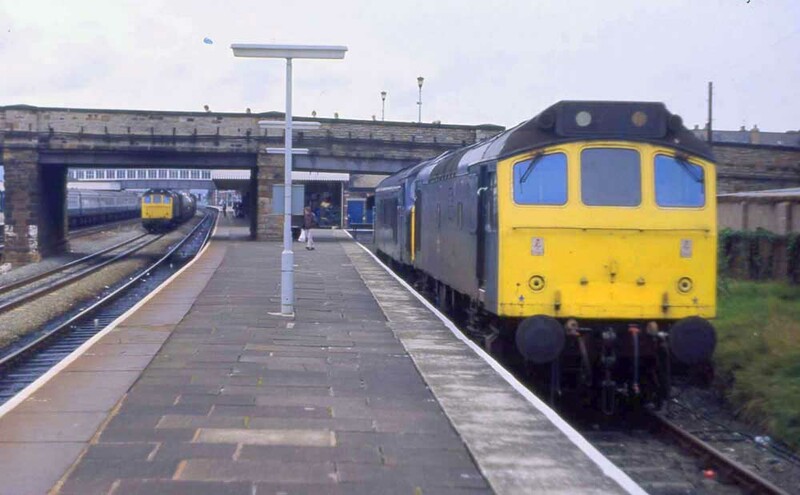 1980 saw three workings over the Cambrian line to Aberystwyth, on June 7th 25089 & 25209 worked the 04.10 Shrewsbury - Aberystwyth and the 10.07 Aberystwyth - Euston to Wolverhampton. The same diagram was worked by 25089 & 25110 on August 23rd 1980, whilst on August 24th the same pair worked the 08.45 Birmingham New Street - Aberystwyth and the 18.10 Aberystwyth - Euston to Wolverhampton. There was a change of scenery on August 31st 1980 when 25089 & 25140 worked the 10.26 St. Pancras - Nottingham throughout. No passenger workings have so far been recorded for 1981. On March 14th 25089 handled the Leicester, Humberstone Road – Parkeston acid tanks. Workings north of the border during 1982 included on August 29th the 18.06 Stranraer Harbour - Glasgow Central after the booked Class 26 failed, the next day (30th) working the 16.10 Glasgow Central - Carlisle and on September 7th the 12.50 Carlisle - Glasgow Central. A relief 21.00 Euston - Holyhead on April 2nd was worked from Crewe to Chester by 25089 & 25245, with 25089 becoming a failure at Chester. On June 17th 25089 worked the 21.15 Preston - Barrow, two days later (19th) working the 18.45 Manchester Victoria - Holyhead throughout. The final recorded passenger working for 1983 saw 25089 assisting the relief 22.22 Stranraer Harbour - Euston on August 7th 1983 between Rugby & Bletchley, dragging 81013 due to the power being off for engineering work. On August 17th 25243 caught fire near Bletchley whilst working the Kings Cross – Tring cement empties, the fire brigade taking seventy minutes to deal with the fire. Rescue came in the shape of 25089, though for 25243 the damage proved fatal with retirement taking place during September. On November 18th 46026, 25089 & 31164 were noted northbound light engines through Newark Northgate. On January 27th 25089 worked a Newcastle - Widnes car special. Pairs of Type 2s were still common on the Ellesmere Port – Riverside bitumen tanks with 25192 & 25089 noted on February 8th. On March 3rd 25089 worked the 21.44 Preston - Liverpool, being the portion off the 18.20 Glasgow - Manchester. Visitors to Newcastle from across the Pennines included 25089 & 25209 on March 15th’s evening Hardendale – Lackenby freight, returning later with the empties. On May 31st an electric multiple unit failure saw 25089 assisting the 08.09 Coventry - Birmingham New Street throughout. Another rescue job took place on June 21st 1984 with 25089 & 25034 (?) assisting the 17.20 Crewe - Derby from somewhere between Stoke & Uttoxeter to Derby after the diesel multiple unit failed. Likewise the following day (22nd) 25089 assisted the 11.20 Crewe - Lincoln Central between Crewe & Derby. June 26th brand new Sprinter 150001 was delivered from York to the Derby Research Centre by 25089. A railtour on December 1st 1984 saw 25089 & 25245 work the Plymouth - Buxton 'Buxton Bullet' railtour between Bescot & Stockport. On December 16th 25089 was noted hauling new (?) London Transport stock between Amersham & Aylesbury. On January 24th the oil trains diverted through Huddersfield due to the derailment & fire in Summit tunnel included the use of 25089 & 25178 and 25196. Their use is remarkable considering the vast array of locomotives (Classes 20/37/47/56/58) which were still idle due to the ongoing coal miners strike. A charter from St. Helens Shaw Street to Euston on April 20th 1985 failed at Bletchley behind 85036, 25089 took the train forward to Euston. On June 5th 25089 & 25209 were noted at Ipswich with the Llanwern – Parkeston tanks. When 31430 failed at Leicester on June 10th with the 10.20 Birmingham New Street - Norwich, 25089 worked the train through to Norwich and returned with the 16.40 Norwich - Birmingham New Street as far as Leicester where it was failed with an oil leak and replaced by 25278. Photograph courtesy Roger Geach collection. Although this view is undated it is believed to be 25089 working the 16.40 Norwich - Birmingham on June 5th 1985 (see note above). The passenger workings in July for 25089 were all north of the border. On July 8th the relief 13.50 Birmingham New Street - Edinburgh was worked forward from Carstairs by 25089 & 25213. A week later on July 17th (or 16th?) the 11.18 Euston - Stirling motorail was worked forward from Mossend by 25089. The final recorded passenger working for 25089 took place two days later on July 19th working the 17.40 Carlisle - Glasgow Central. Photograph courtesy John Powell On September 4th 1985 one of the bay platforms at Rhyl was occupied by two failed locomotives; 45146 & 25206 whilst 25089 approaches with the eastbound Octel tanks. To the left is 33013 heading a passenger service presumably to Bangor. Noted at Severn Tunnel Junction on February 2nd 1986. 25089 was withdrawn on February 24th 1986. Photograph courtesy Danny Preston, collection Neil Johnson. 25089 at Manchester Victoria, date unknown. The locomotive carries no data panel or builders plate. It too would be withdrawn at Crewe whilst undergoing a 'B' exam and end its days at Vic Berry's, Leicester during October 1987. Page added July 27th 2013.